This post is a open draft! It might be updated at any time... But was last updated on March 21, 2013 at 3:38 am. I am doing research again, this time putting together a paper on User Experience, the design of keyboard layouts for languages with romanized (or latin) orthographies and diacritics, and the responsibility or impact that language documenters can or do have with respect to bringing writing in Minority languages into the digital age. So one of the first places I look for inspiration is my social networkIn some of the discussions I have had with other researchers, they have pointed out that their first behavior is to consult the LLBA through their university library. So, I may be unique in my behaviors. By consulting the SIL Bibliography there is the opportunity to discover many of the . This happens to be filled with many experienced colleagues in the field of orthography development and in scripts development and implementation. Many useful things have been written about some of the fringes of what I am looking to write about, but nothing spot on. One might say that I have a unique twist in what I am trying to present. In my Google searching I come across a document complied by Klaus Wedekind titlted: The Development of Writing Systems: A Guide[ref 3] . This resource has some really good information in it, so decided I am going to cite it. Now, Klaus has not added his full name as compiler or editor in the resource. It simply says: K. & Ch. Wedekind. So I do a Google search for K. & Ch. Wedekind. 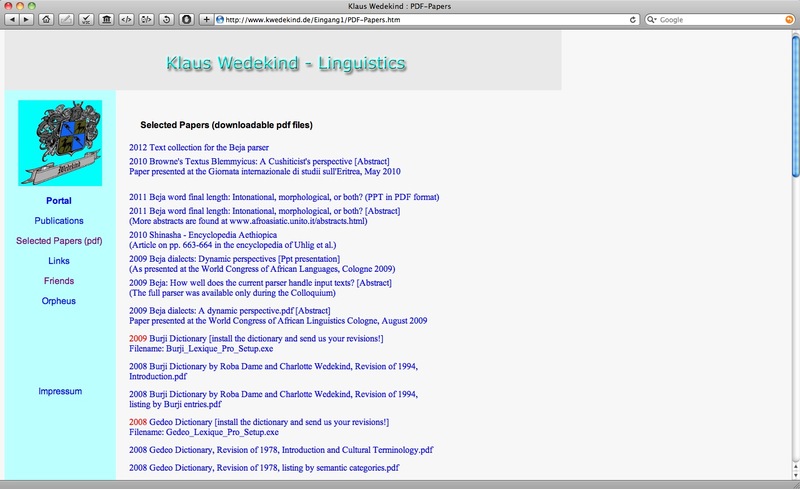 I find a rather nice website where I find that Klaus has quite a few linguistics resources. I also find something else which makes me suspect that Klaus might be affiliated with SIL International. So, I fire up the SIL Bibliography and sure enough Klaus has 55 publications in the SIL Bibliography.For technological reasons, it is also interesting that a Google search for an individual on the World-Wide-Web does not return rank results from the SIL Bibliography very prominently in the search results. Klaus' list has more items (including some of the same items). Klaus' list has PDFs which are readable, downloadable and usable. This leads to some very obtuse conclusions about the usefulness of SIL's Bibliography (that is if SIL's Bibliography is indeed designed to be a gateway to accessible information). If Klaus's list has PDF's which are readable and freely available, which is more useful? Which should be the first destination for a user to click on in a set of returned results? Which of the two pages should Google rank higher? I hope that the bibliography website might be there to provide access to the actual resourcesThere are a few cases where SIL (or any archive) may not be legally able to distribute. For instance, a copy of an item in a professionally published journal where SIL did not procure dual copyright (where the publisher of the journal holds non-exclusive copyright). Or where an SIL person published a chapter in a book and the person did not provide the archive with a pre-print version of the chapter. In these cases, if the archive has a physical copy then the object refereed to in the record, then the record should say it is a physical holding and not a digitally accessible item. If the primary publisher has a DOI or a URL to their version of the digital object then this linking should be provided.. But is this just a pie-in-the-sky expectation, a hope or is this reasonable expectation? I suggest that finding actual resources attached to citations is not a pie-in-the-sky expectation. In fact a growing number of internet users expect to find meaningful and useful the results to their searchers. [ref 5] A growing number of internet users and information providers also expect their searches to terminate with some sort of action. Trends in research and trends in internet usage haven both shown us is that lists are useful. But today's internet behaviors lend themselves towards the expectation for data to be accessible and actionable. That is, today's internet users expect not to use the intent to find out about a resource but to be able to get the desired knowledge so they can make a decision and the following necessary actions. [ref 6] On the part of the users there is a growing behavioral assumption that if I can not find it then it does not existThe corollary of this is also true: That if something does exist that Google will know about it. Ask Google Because Google knows everything. However, is this expectation for resources to be accessible through the SIL Bibliography just an expectation of the website users, because of their interaction with other websites? Or is this expectation re-enforced by the website creators? I suggest that the expectation is reinforced by the website creators. To illustrate this point, I will use 4 entries from the SIL Bibliography. The first entry is titled: Participant Reference in Inca Expository Discourse. It is shown in a screen shot below. It is an entry for a manuscript which, according the the entry was created in 1975. However, the website says that the resource is available 2011. What is confusing is, if this resource is availableThere is another possibility for the interpretation of available. Because the Bibliography is managed by the Language and culture Archive of SIL, it is possible that rather than available they mean Accessioned, or the date the item was received by the archive. If this is the case then the choice of wording is still poor and communicates the wrong thing to the user., then how do I as a user really access it? There is no link to the resource and there is no form for the user to request the resource. There is also no indication as to whither the resource is a digital resource or a physical resource. If the resource is physical, then is a copy what is available or does a viewer have to come to where the resource is locate at to view the resource? If this resource is only available for on-site viewing, then where is that site? So what is the total communicated message about a resource? Is it available or not? is the entry useful to the user or not? Notice in this screen-shot that the entry in the bibliography says that it is available since 2011. However there is no URL, link or process by which a user can actually access the resource. There is also no icon or note to the user to say that the resources is only available in physical form, or where that physical form can be viewed at. So is the resource truly available since 2011 or was it accessioned by the archive in 2011? The inference to the user, is that items are available. It is not just the verbiage which gives the impression that resources available to the user through the bibliography. There are some entries which do have resources available. Consider the next screen shot of the entry for Tsom lawantsa. 1986. cuarta edición. México, D.F. : npl. n.p which has two PDF's available. Screen shot of the entry for Tsom lawantsa. 1986. cuarta edición. México, D.F. : npl. n.p from 22 August 2012.
disavows knowledge of the object - they know about it but don't tell the world they know about it, and if you ask the archive about an object potentially being an SIL object procedures will return a "we don't know about that" or a "thank-you, we will look into that" reply. chooses to not help the user find the object - does not disavow knowledge of the object, but does not provide a public record for the object. Some of the Son-of-God debate papers might be included in this category. does not help the user access the object - the return on investment for providing access to the object is minimal, therefore procedurally, rather than principally, access to the object is blocked. An example of this might be Sign Language material mentioned in the SIL Bibliography or some Papers like that of Steve Parker which do not contain links to the final locations where these items can be accessed. 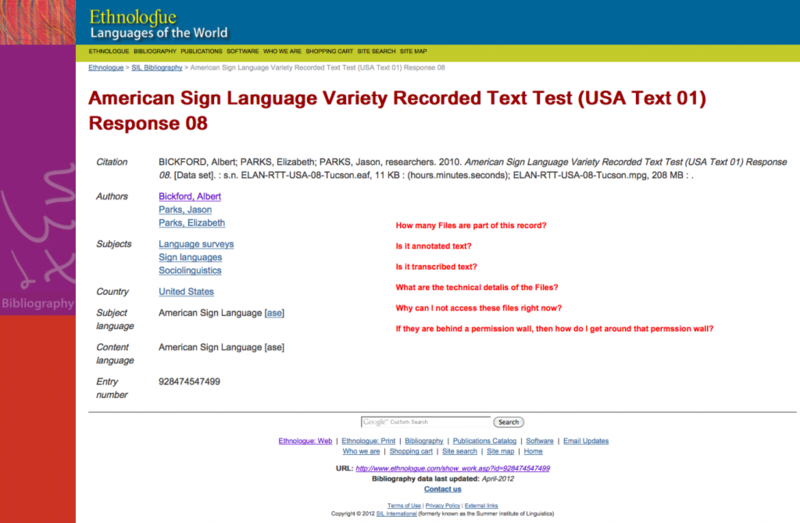 This image of resource record in the SIL Bibliography American Sign Language Variety Recorded Text Test (USA Text 01) Response 08. was made on 8 August 2012. It does not contain links the actual data referenced by the record and leaves several very important questions unanswered: 1. Is this a transcribed text? 2. Is the text annotated? and for what? 3. How many files are part of this record? 4. What are the technical details of these files? 5. Why can the user not access these files at this time? 6. If these files are behind a permission wall how does the user get around (or through) that permission wall? Here is the record of a paper written by Steve Parker. Contrast this with the screen shot of the paper on the publisher's website. The SIL Bibliography does not include a link to the publisher's website, nor does it include other bibliographic data like the DOI. 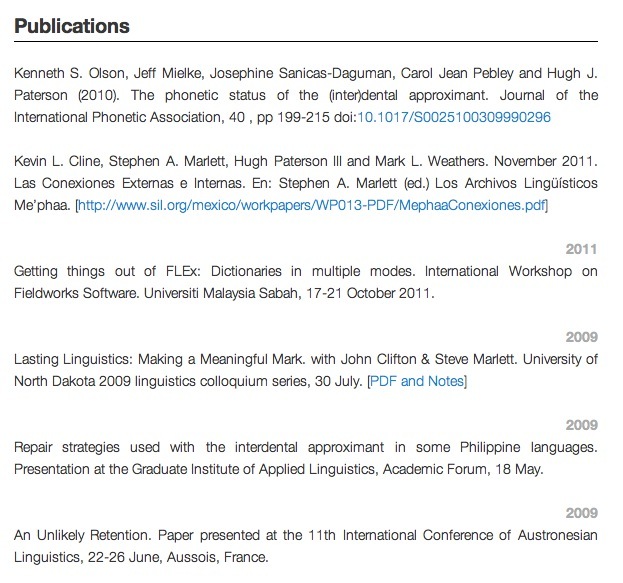 Compare the publisher's meta-data record and the meta-data provided to the user with that of the SIL Bibliography. 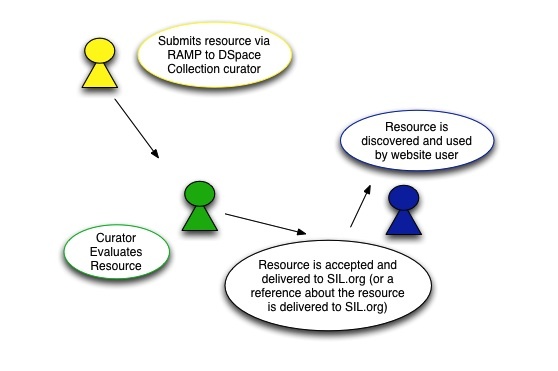 Also contrast how the publisher wants to interact with the user viewing the resource and how the SIL Bibliography creators allows its users to interact with the record and the resource. However, in terms of accessibility and usability, the availability of resources on Klaus' website is not the issue which should make a researcher frustrated and think that the SIL Bibliography is closer to useless than useful. The apparent lack of availability through SIL's Bibliography speaks to more than just usability or accessibility. Before I describe the more that the lack of availability speaks to, I want to establish that Klaus is not an isolated case. 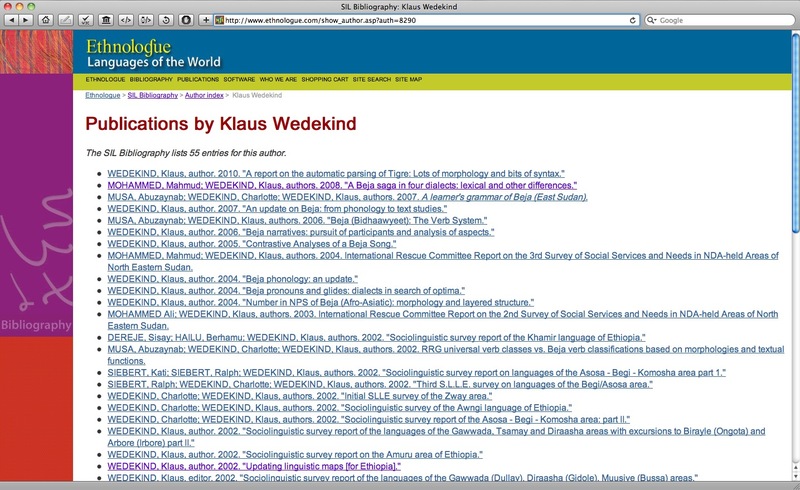 In the following section I will show a variety of cases which have the same dynamic or a similar dynamic as that which exists between the SIL Bibliography and Klaus's personal web-site. This sort of data discrepancy between personal CVs, the SIL International Bibliography, and the inventories of language related archives is not unique to KlausThere is an American saying which goes: Ownership is 9/10ths of the law. Meaning that if SIL does not know that their people are involved in certain activities then they can not claim responsibility for those activities. However, there is a corollary to this. That is, If SIL does not know that its staff are doing certain activities then are those activities which SIL does not know about, part of the duties done under that persons' job description? If they are not, then What claim would SIL have on the intellectual property derived from those activities?. In fact I have encountered it with a variety of other SIL professionals (through the course of my research on various linguistic topics). The following examples show how this phenomenon works with the CV's or online profiles of 12 SIL staff persons and covers approximately 60 situations (potential items or sets of items which could be in the SIL Corporate Bibliography).The issues is not that there are 60 resources which are not in the bibliography, but rather these are 60 resources which are from SIL's finest. 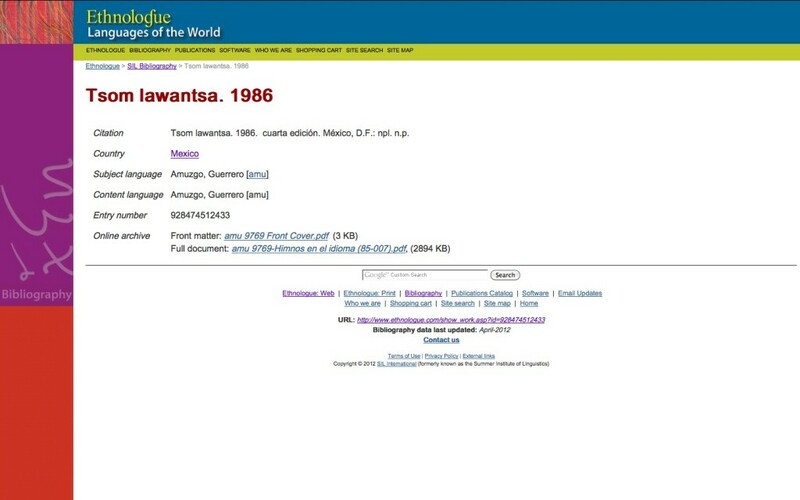 Wuvulu data which is housed in the PERADSIC archive is not mentioned in the SIL Bibliography, even though it was contributed by James Hafford who collected this data while working with SIL. James Hafford and the Wuvulu data records as seek through he OLAC agitator. Seri Data and text by both Mary B. Moser and Steve Marlett who worked with the Seri while working with SIL. Steve Marlett and Seri data as seen on the Ailla archive website. 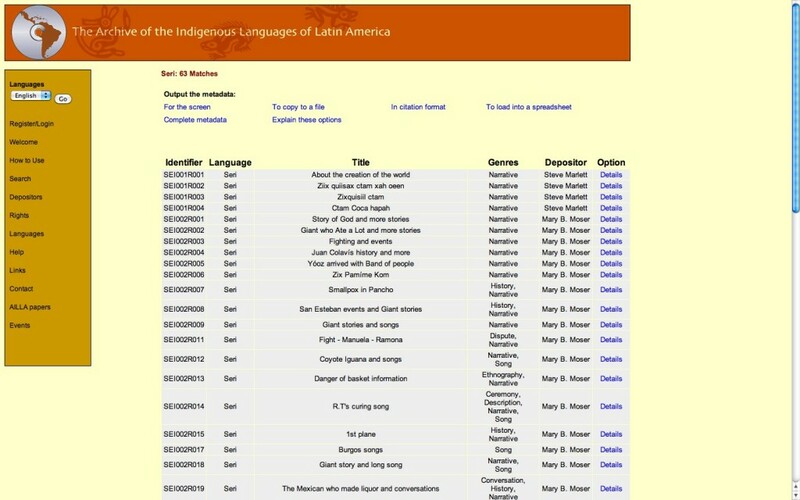 Tom and Doris Payne have extensive experience with SIL and with a variety of languages including the two below, yet these data collections are not mentioned in the SIL Bibliography. 2011. “On the storage vs. computation of complex linguistic structures.” En Zelinsky-Wibbelt, Cornelia (ed. 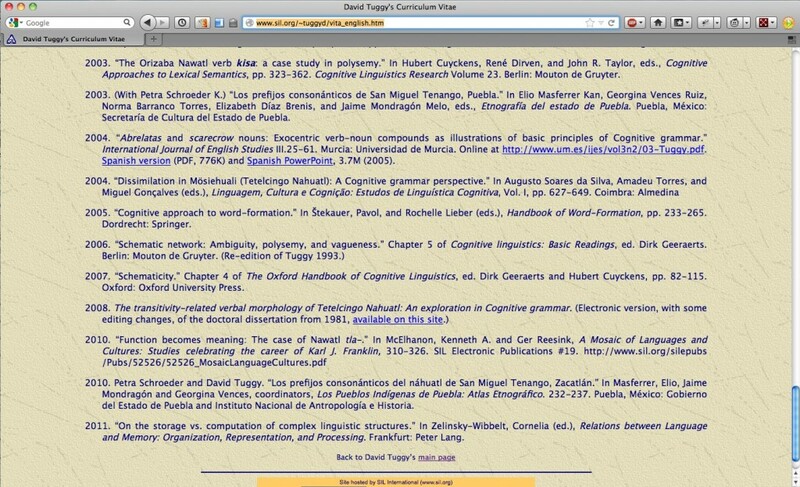 ), Relations between Language and Memory: Organization, Representation, and Processing. Frankfurt: Peter Lang. 2007. “Schematicity.” Capítulo 4 de The Oxford Handbook of Cognitive Linguistics, ed. Dirk Geeraerts y Hubert Cuyckens, pp. 82-115. Oxford: Oxford University Press. 2004. “Abrelatas and scarecrow nouns: Exocentric verb-noun compounds as illustrations of basic principles of Cognitive grammar.” International Journal of English Studies III.25-61. Murcia: Universidad de Murcia. En Internet: http://www.um.es/ijes/vol3n2/03-Tuggy.pdf. Versión en español (PDF, 776K), y presentación PowerPoint en español, 3.7M, (2005). 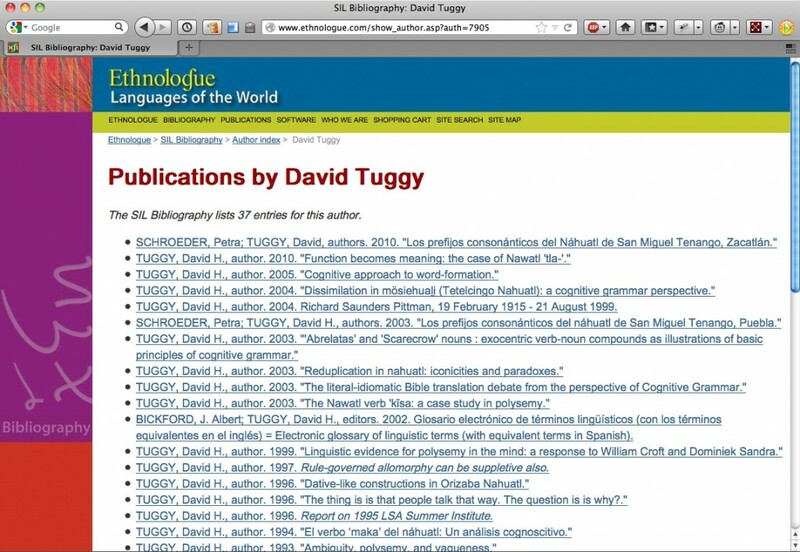 TUGGY, David H., author. 2003. "'Abrelatas' and 'Scarecrow' nouns : exocentric verb-noun compounds as illustrations of basic principles of cognitive grammar." International Journal of English Studies 3(2): 25-61. The primary differences are in the availability of the resources (the personal CV has download-able resources) and the uncertainty of the date of due to two different "data authorities". 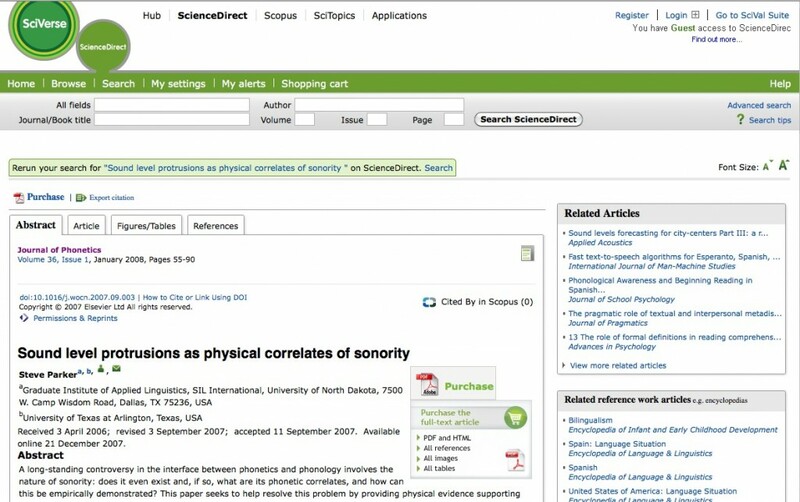 Colleen Ahland shows via her academia.edu page that she has published twice whereas her SIL Bibliography shows only one publication. Neither collection of publications mentions her M.A. thesis (along with data used for the M.A. and Ph.D. data), which generally would also occur in the SIL Bibliography. 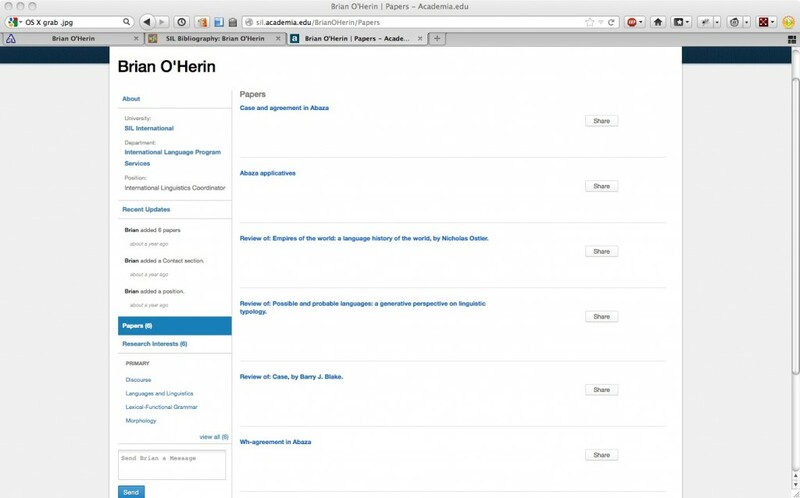 Colleen Ahland's Papers on Academia.edu showing two different papers (one entered twice). 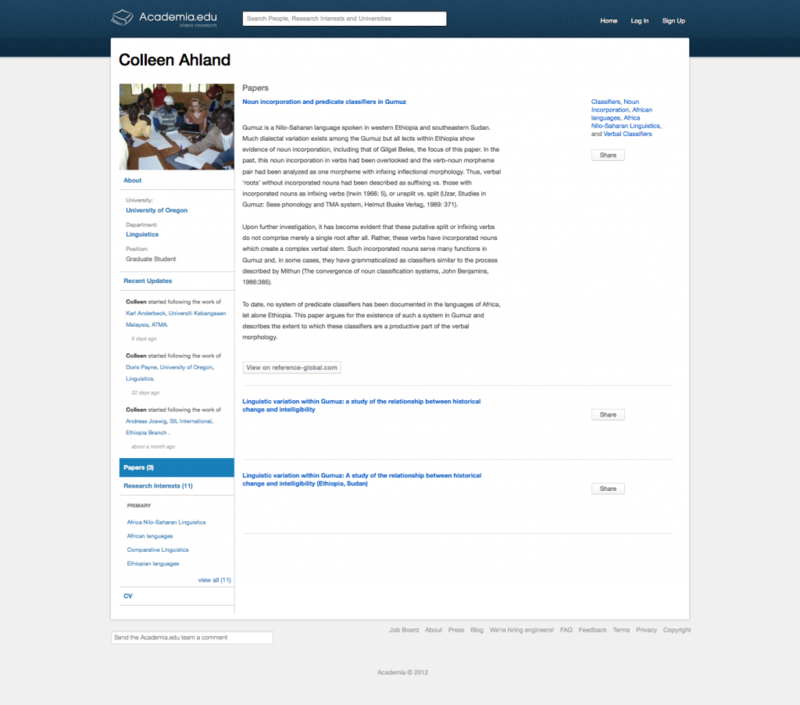 Colleen Ahland's entries in the SIL Bibliography (showing only one entry). Brian is an interesting example because he is currently the SIL International Linguistics Coordinator according to his SIL CV, which is part of the SIL roster, and in that CV his list of papers is longer than is contained in his list in the SIL Bibliography. However, it is also interesting because his Academia.edu profile has six papers and and his SIL Bibliography listing only has five listings. Brian O'Herin's Entry in the SIL Bibliography. Summarizing these resources it seems like the SIL Bibliography is failing to mention the the following papers, both published and presented. While it is possible that Brian became SIL staff after publishing the last three papers listed below; the paper published in Language certainly falls within the scope of his tenure with SIL and all other things being equal should be listed in the SIL Bibliography. ———. 2001. Abaza applicatives. Language 77: 447–493. ———. 1994. Metrical stress in Abaza. In The Nart Epic and Caucasiology: Papers of the 6th Colloquium of the Societas Caucasologica Europoea, edited by Asker Gadagatl. Maykop: Adygea. ———. 1993. Wh-agreement in Abaza. Syntax at Santa Cruz 2: 25–56. ———. 1991. Secondary articulations and feature geometry. Phonology at Santa Cruz 2, 1991. Papers - presented at conferences, on Brian's CV but not in the SIL Bibliography. O'Herin, Brian. 2000. Optimality theory and pragmatics. Paper presented at the Top End Linguistic Circle, June, in Darwin, Australia. ———. 1999. Abaza applicatives. Colloquium presented at the University of Oregon, July 28 in Eugene, Oregon. ———. 1996. Word Order Variation in Abaza. Paper presented at the Eighth Colloquium of the Societas Caucasologica Europaea, June, in Leiden, Netherlands. ———. 1994. Incorporated postpositions in Abaza. Paper presented at the Seventh Colloquium of the Societas Caucasologica Europaea, July, in Marburg, Germany. ———. 1992. Long distance dependencies in morphology. Paper presented at the Fifth International Morphology Meeting, July, in Krems, Austria. ———. 1992. Lexically specified foot structure in Abaza. 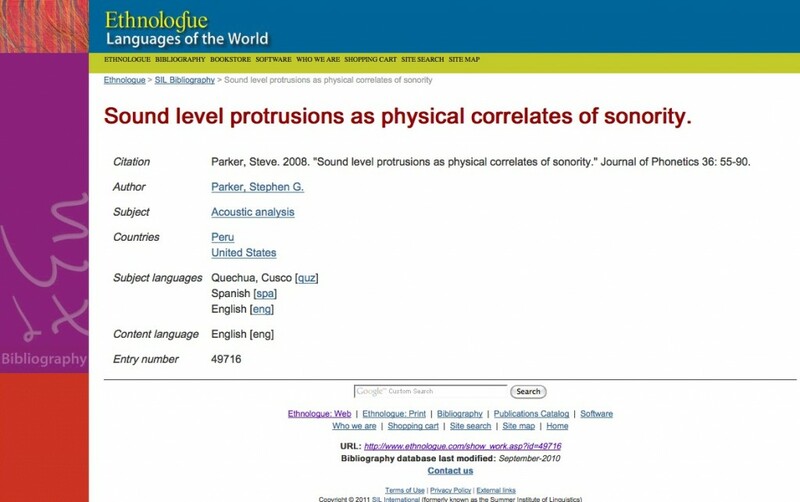 Paper presented at the Seventh International Phonology Meeting, July, in Krems, Austria. ———. 1992. Metrical stress in Abaza. Paper presented at the Sixth Colloquium of the Societas Caucasologica Europaea, June, in Maykop, Russia. ———. 1988. Language use for a minority within a minority. Paper presented at the XII International Congress of Anthropological and Ethnological Sciences, July, in Zagreb, Yugoslavia. The example of an ELAN Manual. Albert Bickford wrote a Manual for the computer program ELAN. 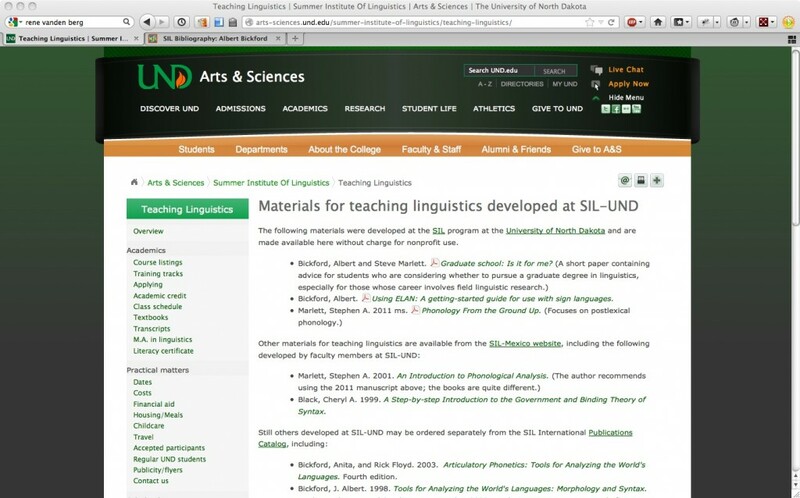 It is available from the SIL-UND website at http://arts-sciences.und.edu/summer-institute-of-linguistics/teaching-linguistics/. 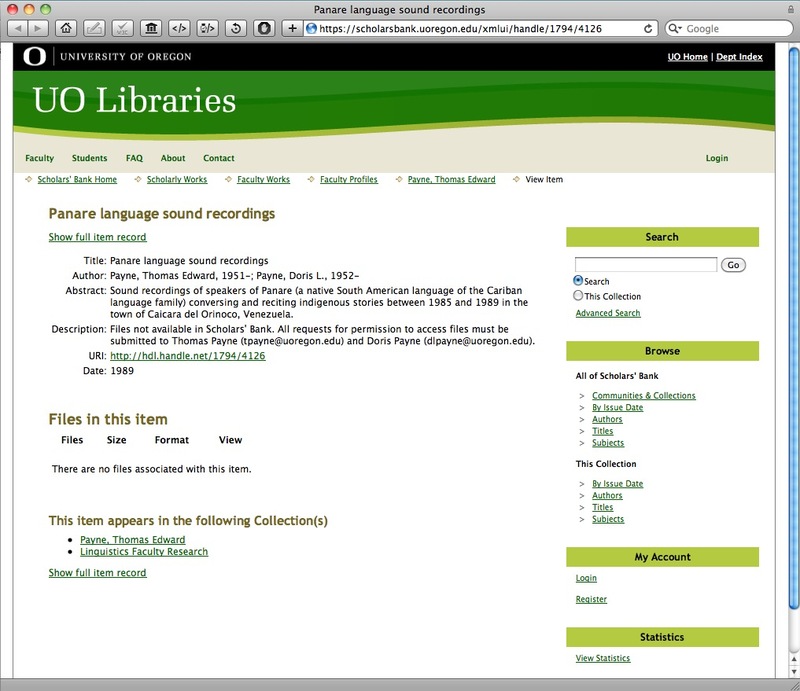 This same resource is not available through the SIL Bibliography; either under Albert Bickford, teaching resources, or resources for computer programs related to linguistics. Users Manual for ELAN on the SIL-UND website. 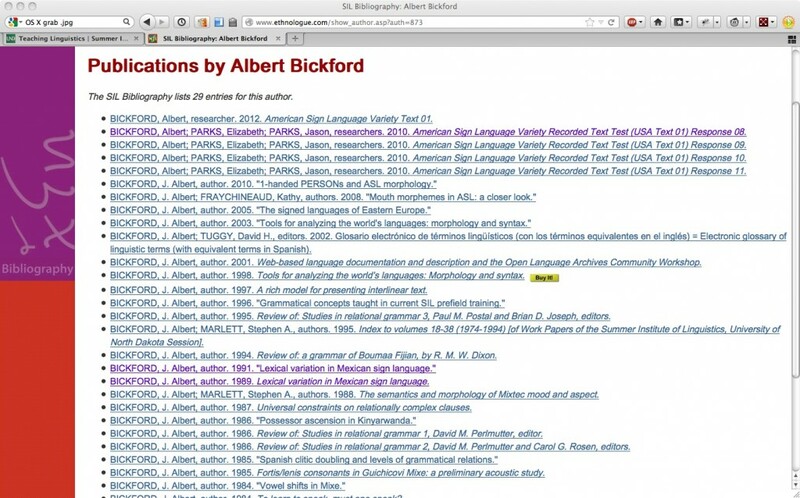 Abert Bickford, the author of the ELAN Users Manual found on SIL-UND's Website, his profile on the SIL Bibliography does not include this resource. Is the raw data accounted for? Rene van den Berg 6 more papers and presentations than contained in the SIL Bibliography. The first challenge is one of organizational affiliation. I work for SIL AmericasArea an organizational unit of SIL Internaitonal, not SIL Mexico Branch, which is a separate chartered entity. Because SIL Mexico Branch is the publisher, and the language covered in the paper is serviced by SIL Mexico Branch it means that the paper would be submitted to a collection in the archive which is administered by SIL Mexico Branch. However, because I am not working for SIL Mexico Branch I am not able to submit to that collection because it is only open to submissions from SIL Mexico Branch MembersThere is a technical difference between staff and member in SIL lingo, this distinction does have ramification on the person-archive relationship but further clarification is beyond the scope of this discussion. 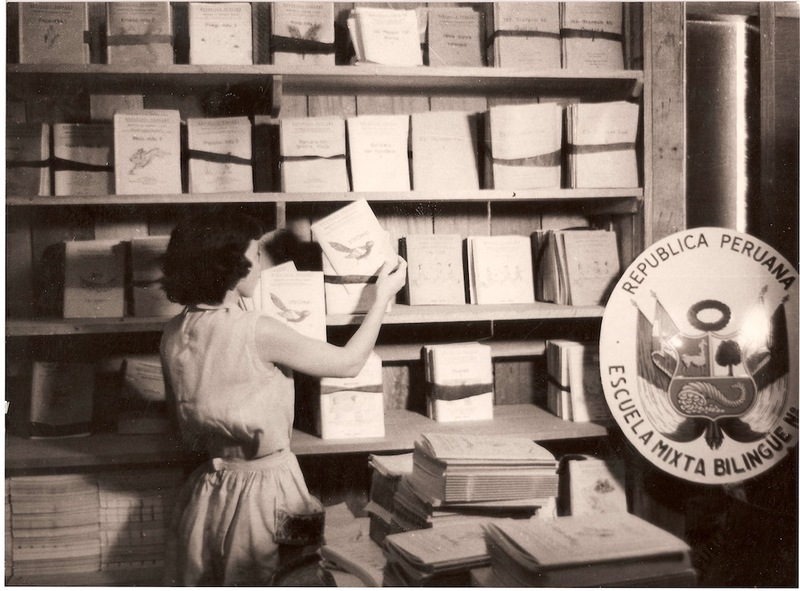 The fourth challenge in archiving Electronic Working Papers as they are in the SIL Mexico Working Papers Series is one of a technical nature. The papers in this series are able to be updated on a regular, or sporadic basis by the author. This means that if a copy is archived, it is only a version of the paper which is archived. Ideally any time an update occurs to the working paper, that newest version would also be archived (automatically). This is the challenge of versioning meeting archiving (or BitBucket (SVN)BitBucket is a code sharing service similar to GitHub. meeting DSpace). The fifth challenge has to do with the human workflow of submission to the archive. It is this challenge that Jeremy Nordmoe and SIL international are addressing in development and implementation of RAMP. [ref 14] This question though centers around How does the individual SIL staffer submit content to the archive? This is probably the least complicated of the challenges because of RAMP. However, not to be underestimated in regards to challenges, is the training involved to educate submitters in the use of tools like RAMP. RAMP, as a software tool can only facilitate defined business processes. Since all of the above (save #4) deal with business processes, this also affects the human interaction with tools like RAMP. Hugh Paterson III's entry in the SIL Biblography. But in each case none of the institutions under whom I was working as staff have asked or informed me how to submit this content. These organizations would include SIL-UND, SIL Malaysia, and SIL AmericasArea. This is dynamic is a little bit different in SIL than in academia because SIL staff are considered "workers for hire" and therefore subject to corporate policies which require submission of this content to the appropriate SIL Archive. Though many academic institutions are deploying university wide repositories which are serving the same basic function. A rough diagram of the RAMP and submission process from Nordmoe 2011. In the larger picture of the research world which include topics like: community interactivity, social impact and social influence through resource discovery availability, usability and credibility, there are some interesting implications of the sorts of anomalies as are presented here through the efforts of Wedekind, Marlett, Tuggy, Jordan, the Paynes, Aahland, O'Herin, Leivinson, and Hafford. These implications can be understood to reflect on the individual, SIL International as an entire organization, and/or on independent organizations within the network or SIL organizations. Organizations such as SIL-PNG, SIL-Peru, SIL Mexico, SIL Malaysia, etc. What is to be applauded? Each of these researchers must have a belief in sharing their knowledge and being relevant to the communities they are involved in or they would not have take the steps to make their knowledge available via the internet. However, one must ask the questions: Is sharing something on the internet in this manner appropriately useful? - Especially to the target audience. Researchers sharing resources should be concerned with issues like What is the permanence of this resource on the internet? and What is the accessibility of this resource to the general public? Many in academia are familiar with the transient nature of young doctorate students and post-doc fellows. In the field of linguistics recent Ph.D. graduates often do a post-doc and then fill a temporary (or lecture level) position before they find a tenure track position. It is often the case that at each institution they are given a web space where they can post an on-line CV. This is also often a time in their career when they publish often. It has been my experience to notice that various institutions have different policies on how long they will retain these web CVs after the young Ph.D. moves to a new institution. Many times it is the case that the young Ph.D. will only update the CV at the most current institution. This transient behavior leads to resources being mobile and not being available at stable URIs as the professional progresses through their career. While Google can solve the find-ability issues of transient resources, find-ability does not help in the citing of resources - a crucial dimension for academics.This social problem becomes even more acute when one takes in the perspective of how information is being transmitted in today's society. Traditional media sources like journals are still used because academic institutions have requirements on academic staff for publication, but journals are not the primary means of knowledge transmission in a digital age. [ref 15] In the case of young academics, why not just self publish, release a PDF and mark it "draft" or put that video on You-Tube? 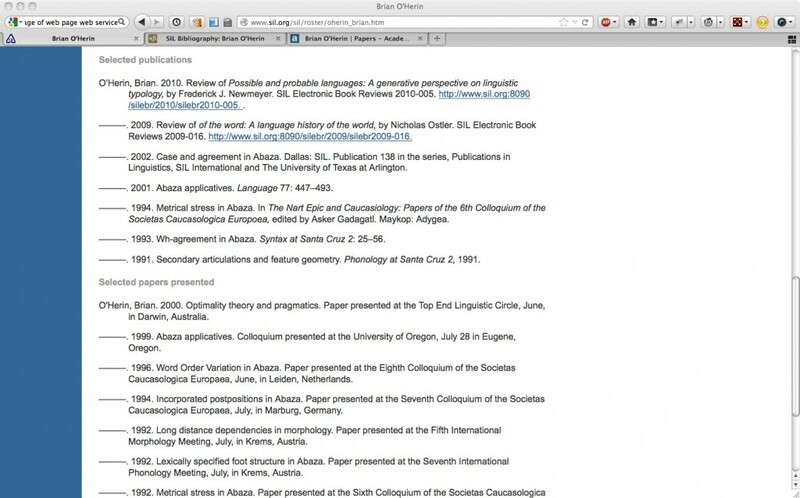 One strategy that some academics have use is to deploy personal websites. While this does provide some stability when considering the issue of multiple institutions, it does not consider the long term permanence of that resource. If a resources is on a personal Résumé or CV like website then What will happen to that resource, or to the accessibility of that resource when that person dies or changes the base URL of there personal website? The download location of a resource is also very important people accessing a resource are accessing it from a variety of devices and through a variety of search engines. The visual context surrounding a given resource and the associations to other related resources as they are visually presented to the user accessing the resource add or detract from the esteemed value of that resource. Building credibility with a user of the resource is done visually and it is done with context to other resources of interest to that user. This is all in the mind of the resource user before they even access the ideas contained in the actual resource. 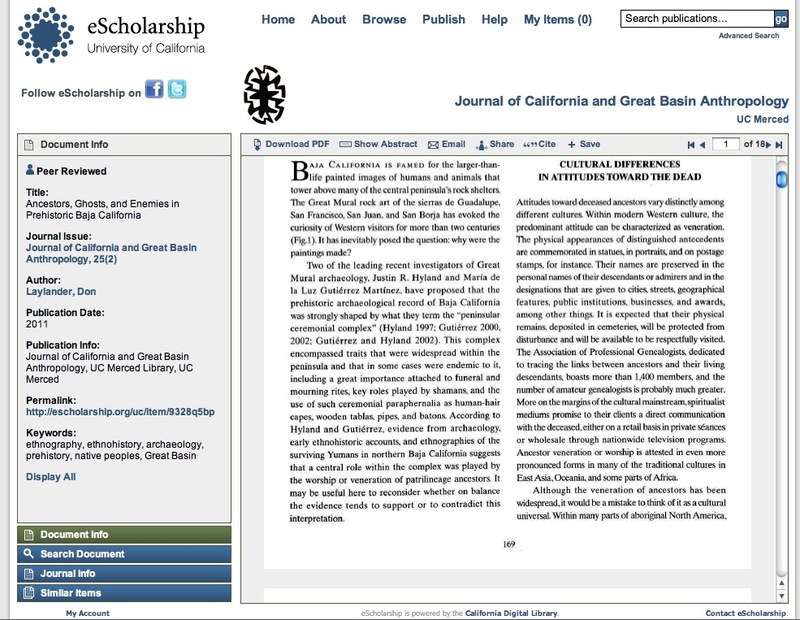 A great example of providing context for a resource and the resource from the University of California. What does it mean to stand on the shoulders of giants? SIL International has had its share of world class thinkers and world changers. Many notable people in the field of linguistics have in some way been part of SIL International's ranks. Even today many experienced people with experience on particular minority languages, on various educational methodologies employed in language development or in many kinds of electronic and computer related fields can currently be found in the ranks of SIL International. For people who are new to the tasks needing to be accomplished in the journey of language development, it seems completely stupid to not take advantage of this heritage and ask for help from these experienced persons. The experienced persons should expect to be asked and the new comers should expect to ask. An archive helps facilitate this because sometimes the experienced are half-a-world-away and are never physically met face to face, or they lived half a century before the new comer started working with minority languages. This also means that the experienced need to value and use the archive. It also means that the new comer needs to start with the archive, and expect to use it often. Without this ability to look into the past and learn from previous experience it costs the language communities, researchers, and SIL staff man-hours and resources, affecting SIL International's sustainability. What is the impact on sustainability for SIL International? Language Use sustainability. This is the iterative use of minority languages by their speech communities. Language Program sustainability. This is the continuation of programs and projects in local, contextualized efforts with members of the speech community so that together goals can be reached. SIL International sustainability This is the sustainability efforts which need to occur so that as a corporation SIL International is continually available to engage in projects and programs as a partner to members in minority language communities. This differs from the others, in that this measure, in a for-profit company would parallel "profitability". As a non-profit SIL does not have to concern itself with profitability margins in the same way as a for-profit corporation, but SIL does need to concern itself with human resources for staffing and relationships, talent management for having the right staff doing the right things, and with knowledge management for being able to provide knowledge to the projects it supports. Without these three having adequate functional infrastructure, all projects might be forced to think about life without SIL International.One way to conceive of SIL International is as a reputable platform which people who are concerned with the language development situation of minority languages my use to engage these communities. What I am referring to here is the sustainability of this platform. Having an archive which is functional, useful, pleasurable to use and efficiently situated at the center of SIL International's operations, with a growing community of users provides a space in which SIL's sustainability goals can be met. Most importantly from an organizational sustainability point of view it provides a location where real people can connect over data, social challenges, solutions, skills, and common interests. However, the archive when it is maximally useful will also affect the sustainability of language use in the communities which SIL is engaged with to facilitate the long term success of projects and programs. The archive can do this not just by providing access to resources which contain knowledge but also enables connections to people who embody the skills needed to act on that knowledge. What is the impact of not archiving on sustainability for language use which SIL International hopes to foster? The interactive web is still young. Youtube stared in 2005 and Facebook started in 2004. It still remains to be seen if having media available in a digital archive actually affects language use. - By which I mean, there has been a lot of money spent in the last few years to document and archive language samples of lesser spoken and endangered languages. However, having materials in an archive, a DSpace repository, or under lock and key (and appropriately so) for select community members still remains to be proven that it actually helps the language survive the pressures of language change in the 21st century. So, by not archiving and focusing the efforts of those doing language development on face to face relationships - is face to face relationships more productive to the language use goals than taking the time to archive? What we do know is that for those groups who are heritage speakers or who are doing language revitalization work, archived content is immensely valuable. [ref 17] So, there is value in using archived materials, beyond just the ability to say We have X hours of conversation in Y extinct languages. - At least this was the case in 2000 - a few years before the Social Media Revolution. What is the moral obligation of researchers to be able to give back to the community in a way in which the community may not destroy what is being given back to them? So, I think that archiving is really important. It is important in ways that the community and even the researchers doing the research may not fully envision or understand at the time. It is also important not just for researchers and communities it is also important for organizations conducting research be they Universities, NGOs or Grant Funders to require archiving of research data - but this is a moral value which comes from outside of many cultures - sometimes it is also generational and outside of the research culture. So, the real loss to the language community for SIL not archiving is that the community cannot rely on the organization to give back to the community when it is looking for its own linguistic and language heritage. But if SIL does have an archive, and that archive does not contain materials SIL staff have created, then how is it supposed to be useful in the process of encouraging higher levels of language use? Should the Language communities think about SIL in the course of their selection of a service provider to help them with their language development needs? Based on existing personal relationships with professionals, based on the recommendations of trusted friends or the experiences and recommendations of other minority language communities. They will do their own research and look at the available options and make a selection based on their own research. Much of the research of these communities will be based on what they can find out through the web. I have written on this before in The Look of Language Development Websites. [ref 18] The ease of use, access to continued resources including archived content and type of services the partnering organization offers will affect choice. What does it say about SIL Staff's buy-in around the organization's ability to present their work? activity on social networks sites. The discrepancies between the Professional profiles maintained by SIL and the corporate Bibliography represent a failure on the part of the corporation to bring centergy to its information processing and presentation systems. that this is the right job for me but the wrong organization. Someone once told me, SIL is many different things to many different people, so maybe this means that "SIL" doesn't mean sharing these resources through a unified mechanism. The Glottolog provides comprehensive bibliographical and other reference information for the world's languages, especially the lesser known languages. The question presented by SIL academics and SIL authors often can be generalized as: Why should we not put our stuff somewhere else? This sometimes takes the form of Such and such library or Such and such archive - especially if the library or archive is in the country which is indigenous to the language being described. Sometimes it is also stated as Why should we not participate in other projects like Glottolog? 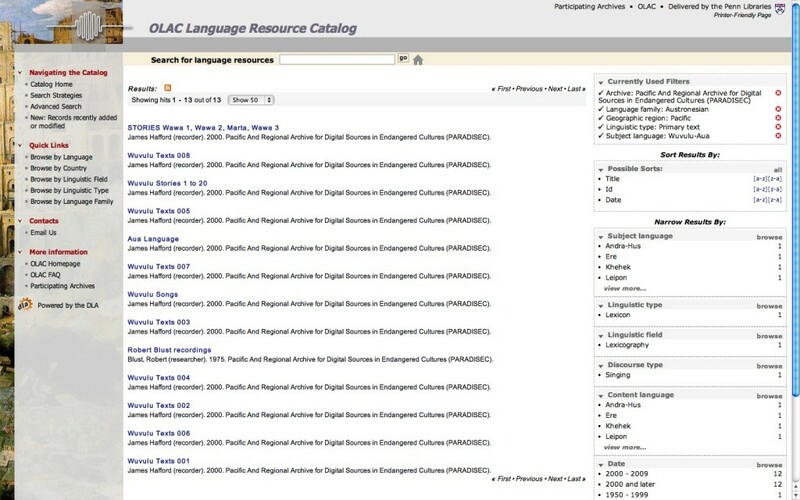 Strictly speaking the Glottolog is only an aggregator like OLAC. 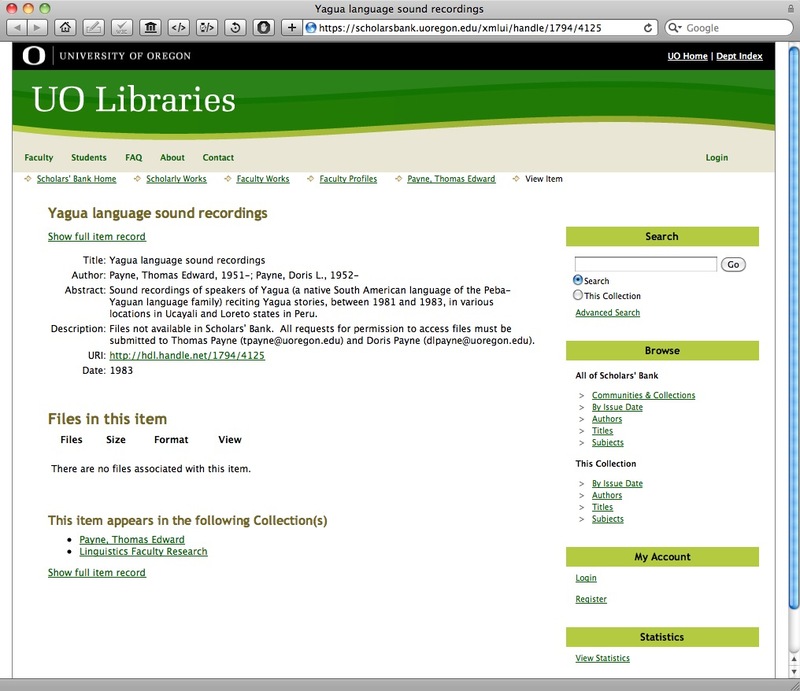 However, perceptions about the Glottolog sometimes pattern impressions of archives and libraries because it is seen as collaborating with other efforts in the linguistic research enterprise. What if SIL is really being successful in doing what it is doing and the current state of affairs is helping that level of success? While one can present a myriad of reasons why SIL International's current web-design behaviors are not helpful to their cause, or the people they claim to be serving, one must also consider that perhaps their design behaviors are truly helpful for achieving their goals. Perhaps the current design behaviors are accomplishing the things that the organization wants to accomplish. Perhaps it is not the goal of the organization to make their materials easy to access, or their systems easy to use. If this is the case, then one should ask more intently: What is the business goal(s) of SIL International? Discuss the place of the social Contract... corporate access only or individual's recursive access.... Some policies are restrictive and some are not. To the determined volunteerSIL International claims that most of the man hours most of the staff contribute to SIL International are contributed by volunteers. Schedule D, Part XI, Line 5 - Some staff whose time is reflected in the Donated Labor amounts notes in Part XII and XIII spend their time developing in house software to facilitate SIL's linguistics and translation work. This time is capitalized for financial statement purposes, then depreciated appropriately. On the Balance Sheet presented in Part X, the fixed assets are presented in the same manner as on the financial statements, including capitalized donated labor. However, since donated labor is not to be included as revenue or expense on the Form 990,the current year impact of capitalized donated labor, net of current year depreciation is removed from reported revenues and expense and is a reconciling item between the financial statements and Form 990 each year. Schedule F, Part I, Line 3 - The number of employees noted includes both employed staff and staff whose time is donated to SIL International. The value of donated labor is reflected in Sch D Part XI and XII. It should be noted that some have said that because they are a volunteer at a non-profit company (U.S. 501(c)3 organization) and receive no wage from said company, that their work and produced intellectual property do not belong to the "employing" organization. This claim may have some merit in U.S. intellectual property law. On the other hand it may not have merit. I do not know at this time. However, I do know that for tax purposes, volunteers are considered employees if the Right to Control can be demonstrated. This definition stems from a common law definition of employee, and therefore may also apply in intellectual property situations. Even if the systems at SIL are not as efficient as they could be there is still some magnificent effort being done by some extraordinary individuals. These efforts need to be acknowledged. Klaus (and others) for making these resources available. Some of us are grateful to be able to stand on the shoulders of giants like you. local administrators for enabling Klaus to get this experience so that he can share it. Jeremy Nordmoe for leading SIL International in ways to enable it to share its experiences more openly. Including helping SIL move from an online bibliography to an online presentation of the content of the Language & Culture Archive. Google for crawling the contents of PDFs since 2001[ref 26] . This entry was posted in Access, Citations, Digital Archival, Library, Linguistics, Meta-data, SIL International, UI/UX and tagged Access, Bibliography, CV, opendraft, SIL International by Hugh Paterson III. Bookmark the permalink.